Description: This quality built home by homestar is ideally situated just minutes from all of grandview corners many amenities and is just minutes away from morgan creek golf course. 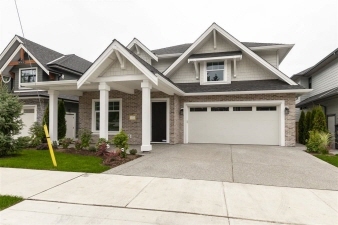 The home features a modern decor with a great room layout, 2 storey family room w/floor to ceiling gas fireplace, spacious dining room & kitchen with custom white cabinetry, quartz counters, quality stainless appliances, & a contrasting slate gray island. The master bedroom enjoys a 5 pce. Ensuite with a free standing tub, large sep. Shower, & a walk in closet. The upstairs also has a laundry room & 2 additional bedrooms. The basement is fully finished with a games room plus a bright separate one bedroom legal suite! Great covered deck perfect for bbqs!